Follow these 5 easy steps to measure your child correctly. 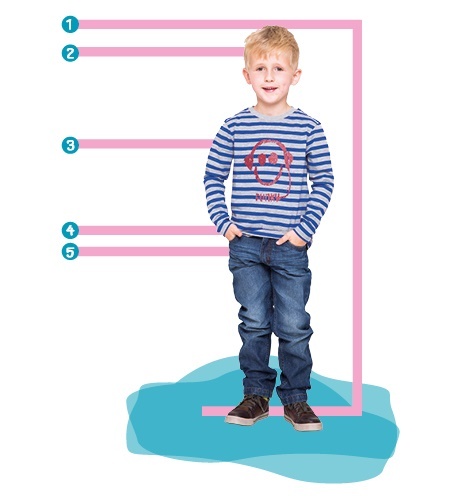 Our tip: play a little measuring game and let your little one take your size as well. Height: Measure your child without shoes from the top of the head to the sole. Head: Measure around the circumference of the head at the widest point with a soft measuring tape. Chest: Place the measuring tape around the body at chest height. Waist: Place the measuring tape around the body at the waistline. Hip: MMeasure the circumference of the hip at the widest point of the buttocks. Bitte Please note that each child grows individually. The stated dimensions are approximate.